From Goodreads ~ Yoga instructor Kate Davidson is ready to marry her boyfriend Michael, so she's disappointed when a special dinner doesn't end with a proposal. But disappointment turns to dismay and outrage as she learns the real problem: Michael is already married and his estranged wife is blackmailing him. 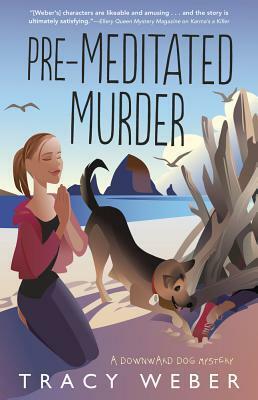 When his wife's body is found - by Kate and her dog, no less - Michael is strangely unable to remember where he was the night she died. Since Michael has no alibi, Kate steps up to uncover what happened. What she walks into is a tangled web of deceit, obsession, and immigration fraud ... with Michael trapped in the middle. Kate owns a yoga studio (the author had a yoga studio in Seattle). She is living with Michael, the owner of a pet store, and her special needs German Shepherd, Bella (based on the author's own dog, Tasha, who passed away in 2016). On her birthday, Kate thinks Michael is going to pop "the question" but he doesn't. It turns out that Michael is already married. A couple years ago, he had married Gabriella, a girl he was dating, so she wouldn't be deported back to Mexico, with the agreement that they would stay married until she attained her U.S. citizenship. Michael had recently contacted her to ask for a divorce but Gabriella had responded that it would come at a cost ... $50,000 cash. As a small business owner and just recently renovating their house, Michael can't afford to pay her. Michael, Kate and Bella, along with Kate's best friend, Rene, and Rene's family (which includes her husband, twin babies and two puppies) travel to Michael's hometown to discuss the situation with Gabriella. It doesn't go well and Gabriella is discovered murdered the next day. With Kate's mother's boyfriend, Dean, as Michael's lawyer and Shannon, Michael's sister, and Rene helping, Kate starts to investigate to find out who really killed Gabriella. This is the third book I've read by this author and I liked it. It is the fifth in the Downward Dog series (I've read the first one and fourth one). Though it is part of a series, it works as a stand alone ... I haven't read #2 or #3 and I never felt lost. I liked the writing style. It is written in first person perspective from Kate's point of view.